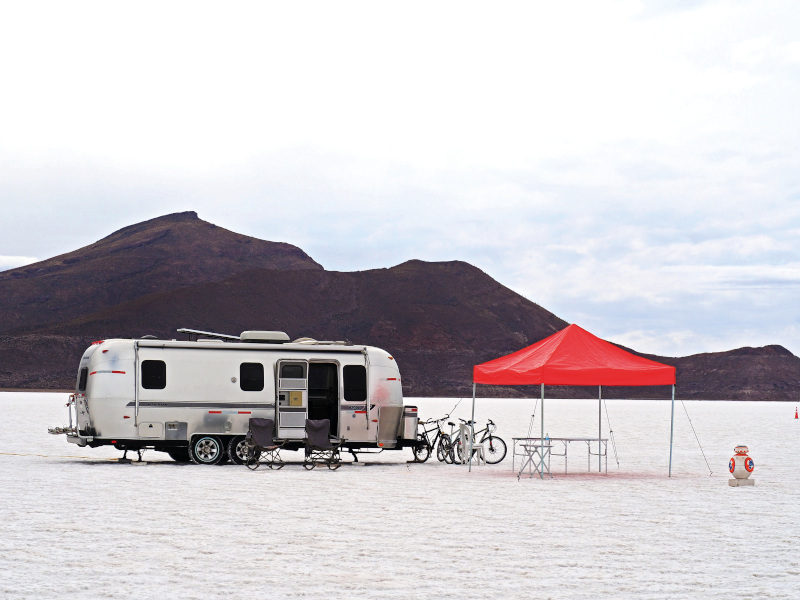 On a remote high plateau in Bolivia, I discover that staying in a luxury Airstream camper van is well worth the splurge to appreciate the dramatic beauty of the world’s largest salt flat. A waist-high replica of BB8, the rolling Star Wars droid, stands guard at the entrance of the stainless steel Airstream camper van. Gleaming in the sun, the vehicle looks like a fish miraculously plonked atop the vast salt plain that is Bolivia’s Salar de Uyuni. It will house us tonight, after our bone-rattling two-hour drive across the Altiplano. 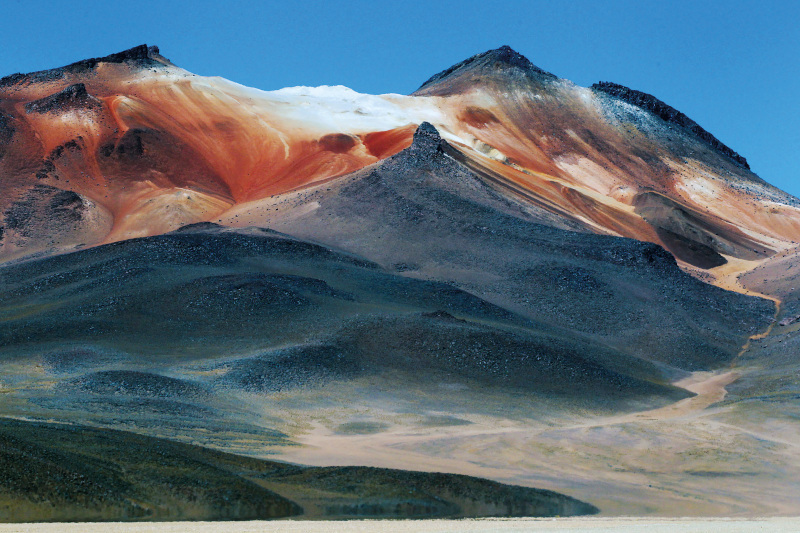 It is a familiar island amid the strange, otherworldly scene of the Bolivian Plateau. Perched at 3,600m above sea level on a plateau in the Andes, Salar de Uyuni, the world’s largest salt flat, is a blinding white expanse resembling an endless field of snow. But snow doesn’t fall here, despite the frigid temperature. What it is, is a solid salt crust that some believe reaches a depth of over 100m. The crystals form a polygonal pattern on the ground but, every so often, holes – or eyes, as the locals call it – appear. You can peer into the clear, briny water for a glimpse of massive salt caverns below, or dip a hand into the icy pool to extract a fist-sized crystal just for the fun of it. The 10,500 sq km landscape is so salty that it is devoid of botanical life, except for the occasional island of petrified coral – the remnant of a dried lake bed – where 10m tall cacti grow in wild abundance. Once in a while, a fuzzy llama or two trots by at a leisurely pace, adding to the dreamlike atmosphere. In areas where the surface is wet, the sky is reflected like a massive mirror – affording an incredible photo opportunity that has propelled Uyuni onto multiple articles about bucket-list destinations. This is the setting for the red-and-white salt planet Crait in Star Wars: The Last Jedi, where the climactic final scene takes place. My guide confirms my suspicions with a smile but won’t reveal if the movie’s stars had bunked in the Airstream while they were filming the movie. It wouldn’t be a stretch to imagine Mark Hamill, Daisy Ridley and Adam Driver sleeping here. After all, this is the last word in luxury accommodation here, on the salt flat. For all its natural beauty, Uyuni – and the rest of Bolivia, for that matter – has been slow in providing travellers with high-end creature comforts. To visit Salar de Uyuni, travellers typically have to sleep at nearby villages where the choice of stays is backpacker hostels or somewhat kitschy salt hotels. 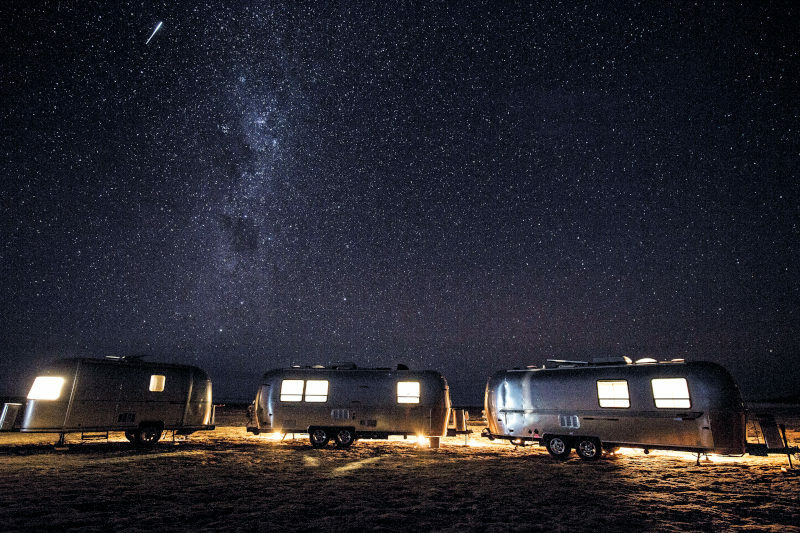 So, when travel agency A2A Journeys recommended the Airstream, telling me this popup is the only way to spend a night out on the salt flats, I was sold. Our camper van is parked in the shadow of the 5,000m-tall volcano Tunupa, a key landmark in this disorienting landscape. My partner and I are the only ones here tonight, effectively making us the sole visitors on the salt flat once the daytrippers return to the villages at dusk. Still, even at full capacity, there are just three such lodging for six guests, hardly overcrowded by any standards. 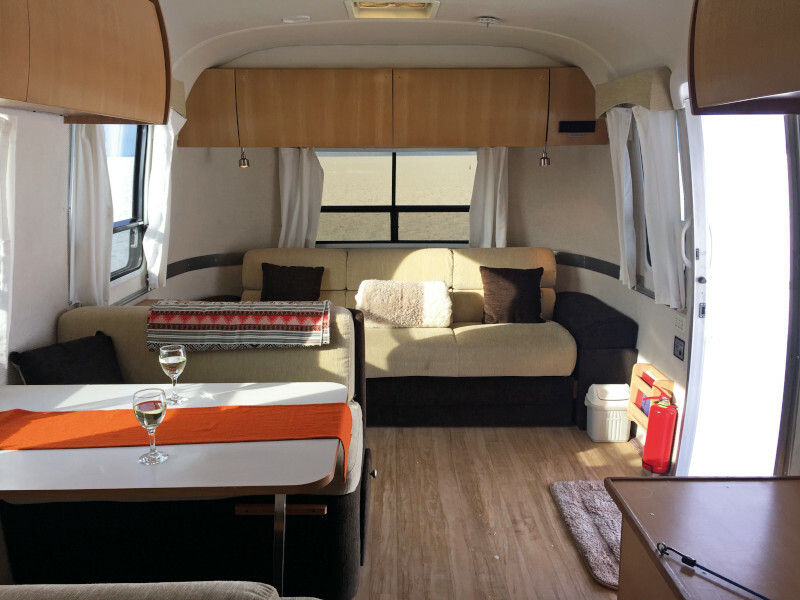 The Airstream, while compact, comes with all the indulgences a traveller might desire while spending time in a vast wilderness. There are crisp white cotton sheets and an electric blanket on the queen-size bed, fluffy bathrobes in the wardrobe, and a fridge stocked with craft beer and snacks. Most importantly, there is hot running water in the shower and reliable central heating, an absolute necessity given that temperatures fall below zero at night. An Airstream crew consisting of manager, private chef and maintenance staff is on hand to provide comfort where amenities cannot. Chef Isaac knows exactly when to offer a hot beverage or a freshly cooked pizza, and dinner, a three-course affair, is served in the toasty warmth of the camper van. Far from the reconstituted dishes associated with wilderness cuisine, perfectly grilled local trout is served along with a tannat merlot from Bolivia’s wine capital Tarija, situated in the same geographical region as Argentina and Chile’s famed wine-producing areas. There’s more to discover beyond the edges of the salt flat, where the landscape of the Altiplano changes from blinding white into a riot of colours straight out of a surrealist’s most vivid dreams. The red sand and snow-capped volcanoes are a dead ringer for landforms on Mars, and millennia of relentless wind has sculpted rocks into twisted, alien-looking formations. Steaming fumaroles and geysers spout hot water and steam, and lagoons shine in jewel tones of emerald, ruby and pearl. 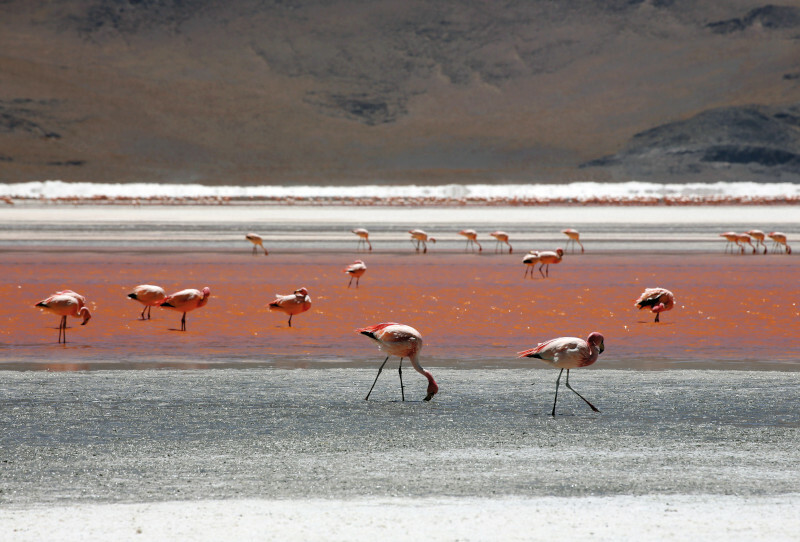 The elusive vicuna, the camelid that produces the most expensive wool, runs wild in this terrain, while pink flamingos congregate at the lagoons to feast on algae. Time seems to have stopped in this corner of the earth, which archaeologists believe has been inhabited by humans for thousands of years. It is almost too much strange beauty to process in a day’s drive. By the time we return to a crackling campfire and Isaac – who is ever ready with an artisanal Bolivian ginand-tonic sundowner – I just want the comfort of something familiar. That’s when Jorge, our guide, tells us to look up. At first, we see only a few bright flickers but, as our eyes adjust to the darkness, a band of stars that comprise the Milky Way reveals itself. Throughout my six-week trip across Latin America, I’ve occasionally sighted a constellation or two but it was never this vivid: a dusting of stars stretching across the night sky. On my final night in Uyuni, I am rewarded with the big picture. At last, I see the shapes of the llama, toad and fox that indigenous Aymara and Quechua astronomers once pointed out to their tribes. It feels like these ancient folk tales I’ve been hearing about have come to life. And what a show it is indeed.